Episode 12 - We finally get started with Krishna. 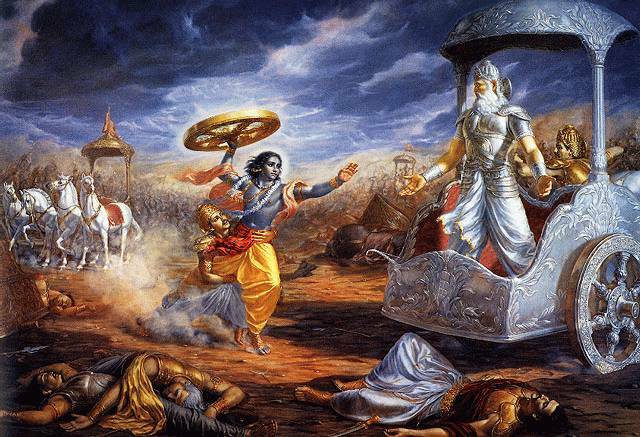 His mother and father were both of the house of Yadu in Mathura-- Krishna's mother Devaki was King Ugrasena's daughter. Unfortunately, Devaki's brother, Crown Prince Kamsa was a bad guy, and he got an early warning that his sister's eighth child would be the death of him. After a palace coup, King Kamsa threw Devaki and Vasudeva into prison and killed their first six babies as soon as they were born. The seventh child, Balaram, was magically transported into the womb of Rohini-- Vasudevas other wife living in Vraja with the Gopas. Unlike Balaram, Krishna managed to be born in his natural mother's womb, but was secretly exchanged with the Gopa chieftain's daughter within hours of their birth. As far as anyone could tell, Krishna was born to the Gopi Yashoda, and Devaki had a daughter who was killed by Kamsa as soon as she was discovered. So, while Krishna and Balaram are technically full brothers, it appeared as if they were unrelated, and Krishna was simply the son of a cowherder chieftain. This arrangement worked well in keeping him hidden from Kamsa, but it must have been tricky convincing everyone that he really had royal blood and wasn't just some low-caste nobody! We'll see how he pulls this off in later episodes. The Bhagavata Purana is so utterly dazzled by Krishna's divinity that these everyday practicalities seem to fade out in the glare, but I'll try to keep a lookout for how the mundane folks around him-- those who did not recognize his divinity-- tried to make sense of his story and his position in society. I have to admit that so far Balaram is a bit of a cipher to me. We are told that he is the avatara of Adisesha, who is the Cosmic Snake; Vishnu's pal. Somehow Adisesha appears as himself when Vasudeva makes his journey with Krishna to Vraja, but Balram was already a child at the time. Later, we are told that Balaram and Krishna are equally avataras of Vishnu. Hopefully we'll be able to untangle this riddle as we go along. So far, I admit that I don't quite get it! If anyone can explain to me how Balaram relates to Krishna, I'd love to hear it. I'll try to come up with an analysis of the two characters as we move further along into the story. They make an amazing contrast, often taking opposite sides on important issues. These stories have been told repeatedly, artists have tried to reach out to people through their various styles, through dancing, music, art.etc.. but it still seems as though it is fresh through your podcast. These stories no matter told innumerable times still never looses its charm. Just wanted to thank you in putting out through these episodes and explaining it. Just enjoying all your podcasts one by one.